A pregnant woman was wounded in the leg Sunday evening in a shooting attack south of Hevron. Doctors delivered her baby; mother and son are well. Site of a shooting attack (file). A pregnant woman was wounded in the leg in on Sunday in a shooting attack on the car she was traveling in, south of Hevron. The victim, Netta Zucker, was taken to Be'er Sheva's Soroka Hospital in moderate condition, where doctors performed an emergency caesarean section and delivered her child, a baby boy. Both the mother and baby were said to be in good condition on Sunday night. According to initial reports, terrorist gunmen ambushed two Israeli-licensed vehicles that were traveling near Tene-Omarim in southern Mount Hevron. They missed the first car but hit the second, wounding Zucker, who was in her ninth month of pregnancy. Sharon Zucker, the wounded woman's husband, who was behind the wheel and was also lightly wounded in the attack, kept driving the car until reaching an IDF checkpoint. He reported the incident to the soldiers at the checkpoint and continued driving for more than 15 miles until he reached Soroka Hospital. Large forces of IDF soldiers and police were combing the area and searching for the perpetrators. Fatah's military wing, the Al-Aqsa Martyrs Brigade, and the Al-Quds Squads of the Islamic Jihad later claimed joint responsibility for the attack, claiming in a statement that the attack was carried out to mark the 15th anniversary of the killing of Fatah founder Fat'hi Shkaki. In response to the attack, the Judean Residents' Council said Sunday evening that Defense Minister Ehud Barak, "must start protecting Israeli civilians in Judea and Samaria rather than devoting his time to [their] suppression." The council's statement explained, "As the persecutions against the settlers increase, dealing in defense decreases. Ehud Barak: Do your duty and provide security or go home!" 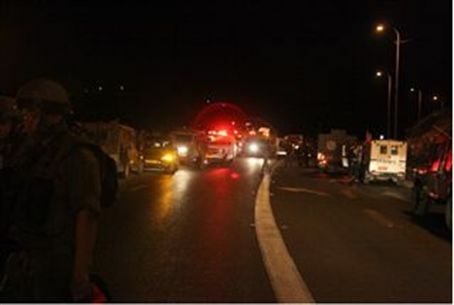 The Komemiyut organization also responded to the attack in s statement which said: "In the face of the country's stuttering leaders, the Arab enemy continues to strike indiscriminately, while Defense Minister Barak deals with the suppression of Judea and Samaria residents and abandons the security of Jews. Jews have lost their lives on the whims of a man determined to continue to experience failures." The statement continued: "A Minister of Defense who cannot stop a few hooligans rioting in the capital, brings disaster on Israel's deterrent force and thus allows our enemies to continue and try to hurt us." This is the third shooting ambush in Judea and Samaria in less than one month. On August 30, just as US-sponsored “peace talks” between Israel and the Palestinian Authority were starting, terrorists murdered four people and one unborn baby at close range near Kiryat Arba. Two days later terrorists fired at a vehicle near Rimonim in the Binyamin region. A husband and wife were wounded. One was in moderate to serious condition and the other in light condition. Rock-throwing Arabs carried out numerous attacks on cars in different locations in the Hevron area Sunday afternoon. Other rock attacks took place in Gush Etzion and near Ofra. The attacks indicate that while local leaders conduct a 'peace' process, terrorists are stepping up their attacks on Jews.